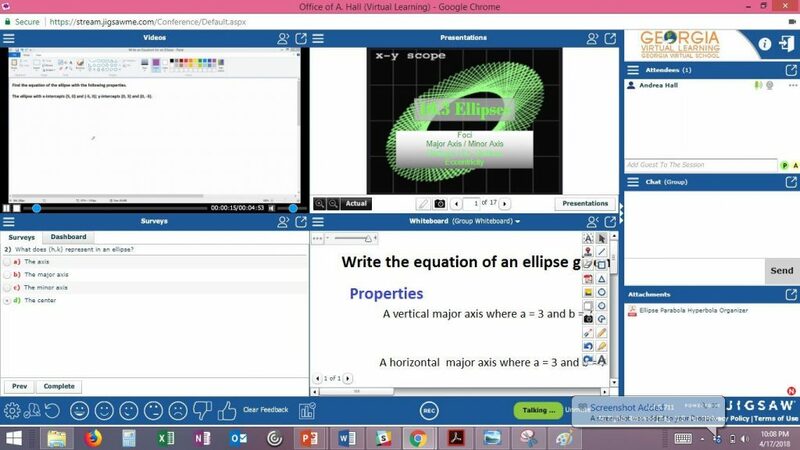 For Jigsaw 104 I decided to do a lesson on how to write an equation for an ellipse. First I created a Jigsaw Storyboard which can be found here Jigsaw Storyboard-2gtj5vc. 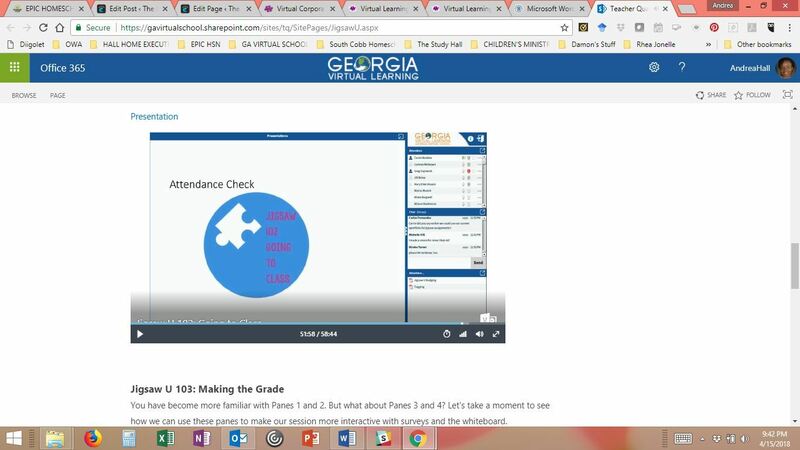 I then created a quick overview recording of an instructional lesson that uses all four panes that can be found here https://stream.jigsawme.com/u/GRpBoL. The use of the panes really allow for increased student engagement. 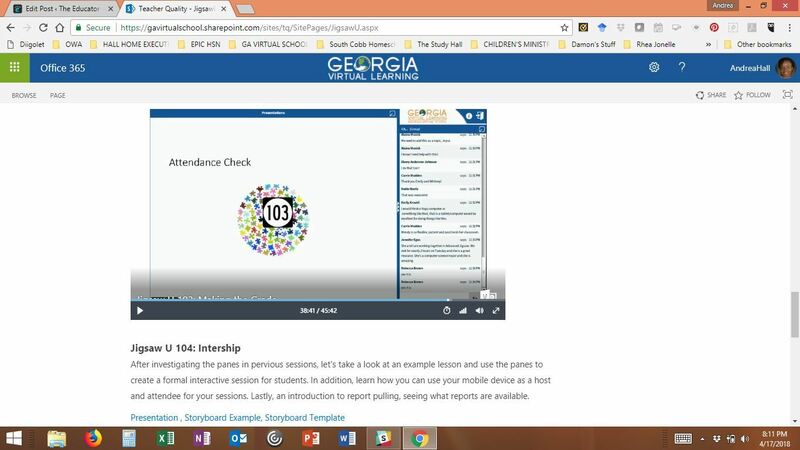 It allows you to grab the student’s attention by the use of audios and videos that stream very well and then allows you to assess student learning by using surveys or activities on the whiteboard. I see that the possibilities here are endless. 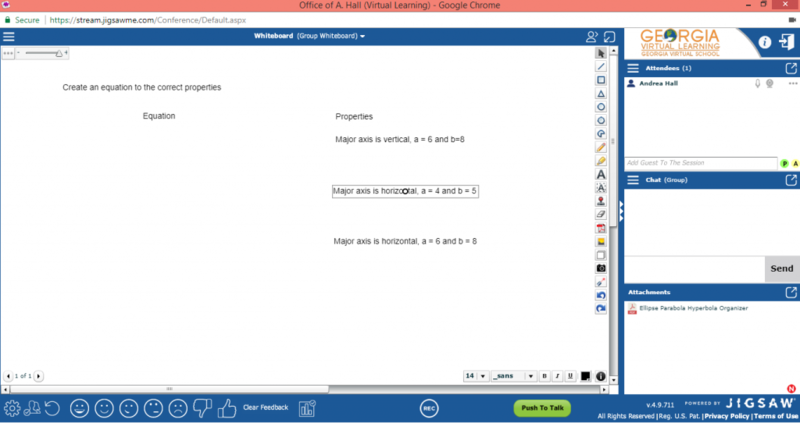 In this lesson I chose to use surveys in Pane 3 and a whiteboard in Pane 4. I love the use of surveys as a warm up or exit ticket to assess student learning. In this survey I ask the students two simple questions to assess their understanding of ellipses: What is an ellipse and what does (h,k) represent in an ellipse. This quick assessment allows me to decide what I need to emphasize in the session. I like the whiteboard to increase student engagement. In this session, after teaching the lesson using Pane 2 I would then allow the students to create equations using the properties that I have given them in Pane 4. I would give privileges to particular students to enable them to write their answer on the whiteboard. The use of Panes 3 and 4 really help to increase student interaction and engagement in the lesson. 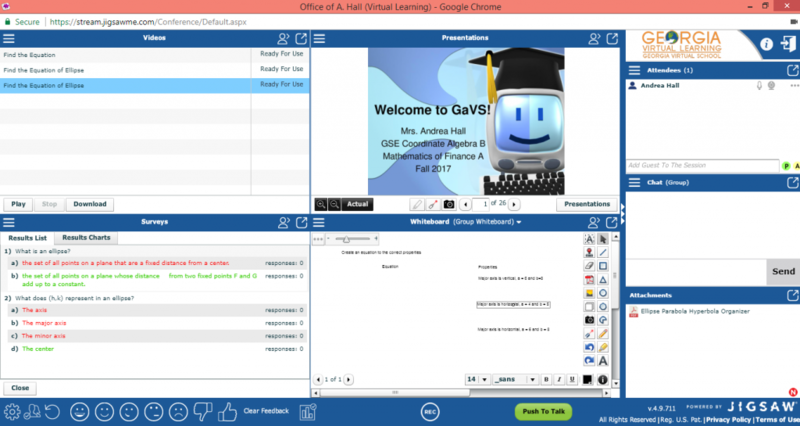 It allows me as the teacher to really get a hands-on view of what my students are learning. 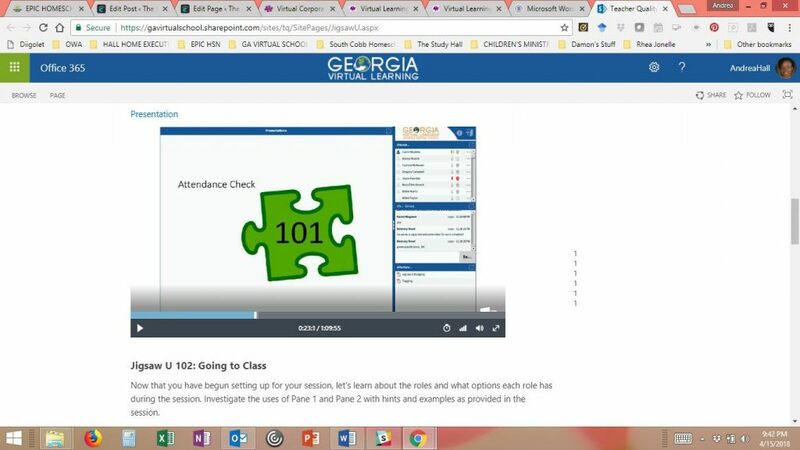 In this screenshot I demonstrate the use of a video in Pane 1 and a document in Pane 2. This method is extremely helpful for students to have a graphic organizer to follow along with while watching the video explanation of how to work a particular problem out. I did not know the two panes were possible instead of four. I am happy that this is a feature because it really helps during instruction to help the students focus on what I need them too. I also see myself using the two panes as a note-taking guide while I am teaching so that students can follow along and not be lost. Welcome to Jigsaw University 101! Above you will find a picture of the 5 diversified assets that have been added to my asset library as well as the unique tags for each asset. To demonstrate that I have used one of these assets in a session I have created this quick clip https://stream.jigsawme.com/u/0qGbF4. 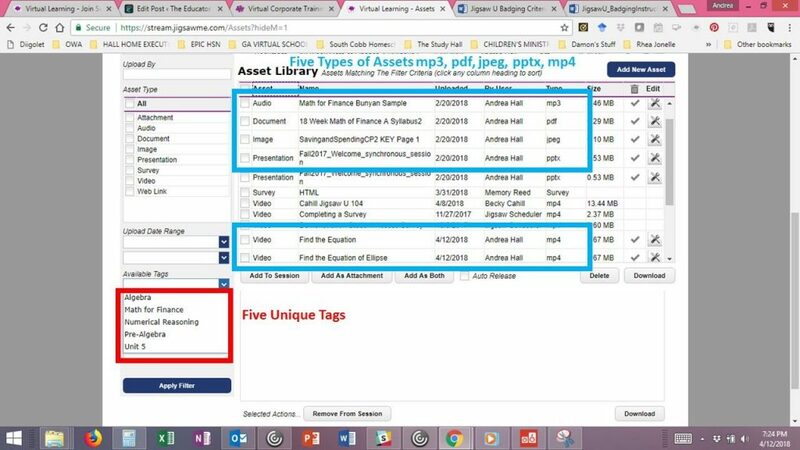 It is definitely a best practice to create and add assets prior to your synchronous sessions because it helps the flow of the class to be better and minimizes connectivity glitches. 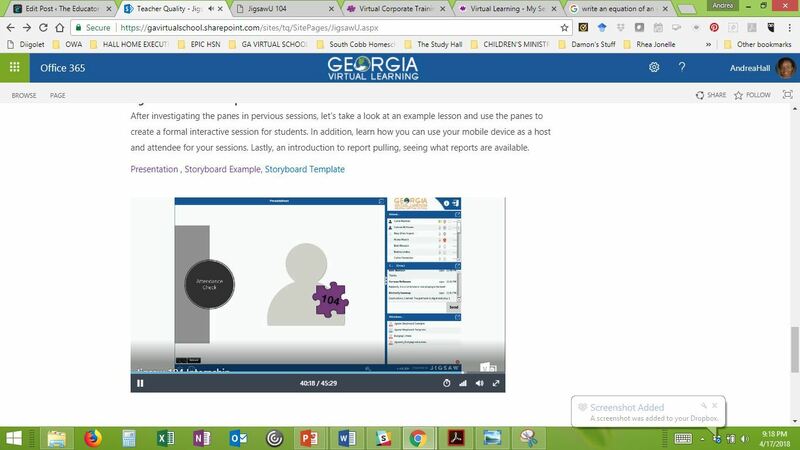 For example, if you upload the audios to the assets prior to class, the audio will play clearly as opposed to forgetting to add the audio, trying to play it from your computer and hoping your microphone will pick up the sound so the students can hear it.